In the worlds of architecture and design, we’re always looking for the best ways of supporting sustainable building practices. This awareness doesn’t have to stop at our driveways but rather, it can extend to the cars we choose to take us to the places we go each day. With Toyota’s 2016 Prius, the daily task of getting from point A to point B can now be experienced with a new level of efficiency, safety, and style. The new model is filled with technology that anticipates your needs as a driver for maneuvering your way through everyday life. You can be fully in command of your driving experience with an available seven-inch touch screen display and a color dual Multi-Information Display with customizable screens. As another element that went into the engineering of the updated shape, the new model holds a lower and wider stance. Besides accentuating a more athletic appearance, this also helps ensure a more responsive driving experience. As the world’s most thermally-efficient gas engine, the design team behind the newest Prius rejected all expectations of what many consumers believe a hybrid is “supposed to look like.” Instead, they went against the grain by creating an unexpected modern design that’s led by purpose. When you dig deeper into the makeup of the vehicle, you’ll find that the sleek facade acts as a mask to a whole slew of innovative technologies, much like a smart home system that lies within an unassuming residence. Also similar to what we look for when imagining our ideal homes, safety is key—and was deeply considered each step of the way when developing the model. 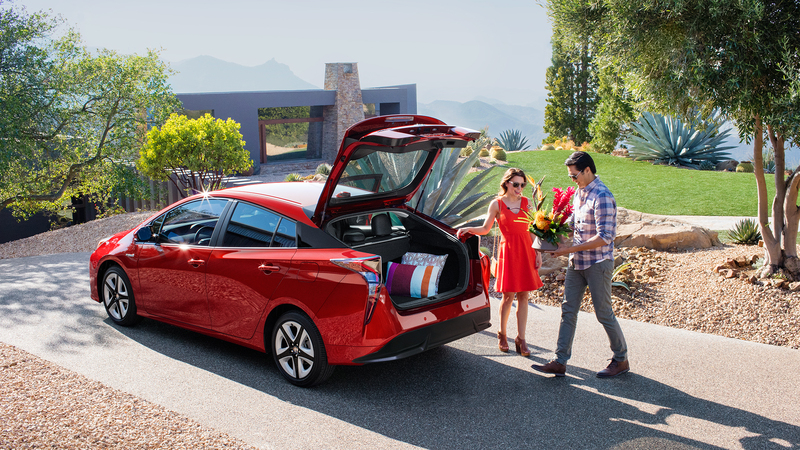 After being around for 15 years, the Prius family of vehicles has reduced an estimated 11,794,335 tons of carbon dioxide emissions* and today, the Prius Two Eco offers an incredible EPA-estimated 58 miles per gallon**—making it a lot more responsible when getting ready to hit the road. To find out the specific features that make this car stand out as a smart choice for an efficient, modern lifestyle, take a look at the following images. If you’re planning on visiting our annual Dwell on Design show in Los Angeles from June 24th to June 26th at the L.A. convention center, make sure to stop by Toyota’s presentation for a special Ride and Drive opportunity they’ll be offering. *Based on average EPA-estimated CO2 emissions rating for Prius versus all MY01–September MY15 cars and 15,000 miles per year. **2016 EPA-estimated 58 city/53 highway/56 combined mpg for Prius Two Eco. Actual mileage will vary.